The Method of melt blowing differs essentially from traditional methods of plastics processing. It proceeds at the boundary of oxidizing destruction of polymers when their technological properties are specified by low viscosity of the polymer mass in a viscous-flow state. This brings about active oxidation of the fiber surface layer, and intensified adhesive interaction between fibers and solid modifiers. The indicated phenomena. 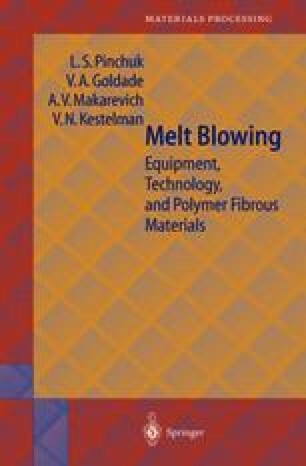 together with adsorptive interaction of fibers with modifiers in a liquid or gaseous state, condition the specific structure of melt-blown materials. They are characterized by the fiber diameter, the density of cohesive bonds hetween fibers. the porosity of the fibrous mass, the modifier concentration, etc. The structural parameters are determined by the technological regimes of material manufacture.